OK...so it is Monday night, not morning :). I actually made a lot of progress this week, but not without a few challenges. Sooo....this is what happened when I turned my back on my puppy (just for one minute). And I thought I only had to worry about the grandkids :). He left quite a few bite marks and a lot of saliva....not sure I can salvage this! Then, on Friday night I put the grandkids in bed and sat down to stitch. I stitched up a storm and about 11pm, I made this mistake. Has anyone else ever done this? For all the times I worried maybe hand-stitching wouldn't hold up, I take it all back - it took quite a bit of working to rip this out! I am glad I only stitched one wrong! So even with the setbacks, I finished adding the 3 background hexagons to 18 flowers. 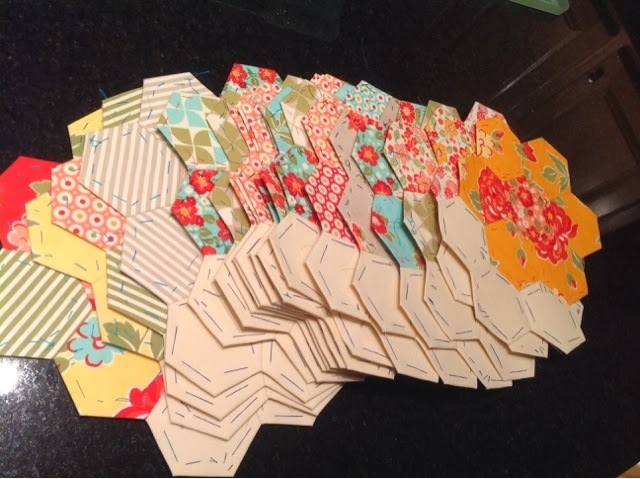 I counted all of my basted hexies - I have 530, which is way more than I thought I had. 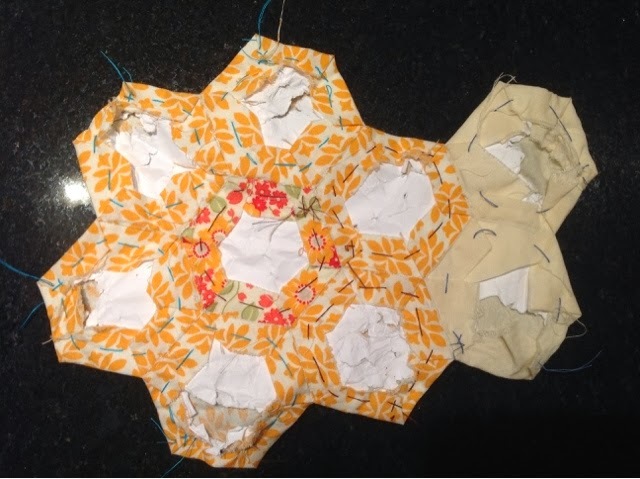 This week I am heading back to making hexagon flowers and cutting more background fabric so I can be ready to stitch the 3 background hexies on a new set. Phew.....I have never gotten so much done in a week! I am alway nervous that I'll reverse one! Am I the only person who loves having a full tray of hexies? Almost makes me sad to pull the out to sew together. Lisa - I share your sadness…I just love having a whole box to look at! As soon as it gets low it just makes me want to baste more! I've done it. It was on one of the samples for the book too, so I'm glad I caught it early. 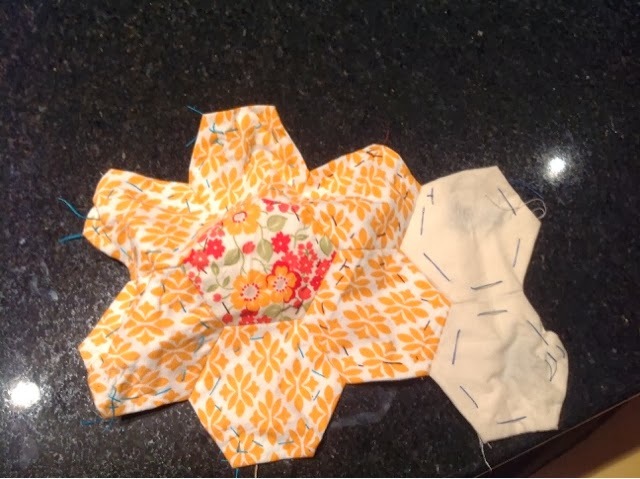 I've never seen a puppy mangle a hexie flower before, but have no fear, I have a solution! So glad that so many people have replied they have done this! I am going to give your suggestion a try - it sure sounds like it will work. Thanks! I keep seeing these beautiful, orderly boxes of basted hexies- I've never done it that way but it looks so appealing! Looks like you have made tons of progress on this- how big are you planning on making this? Hi Jessie! 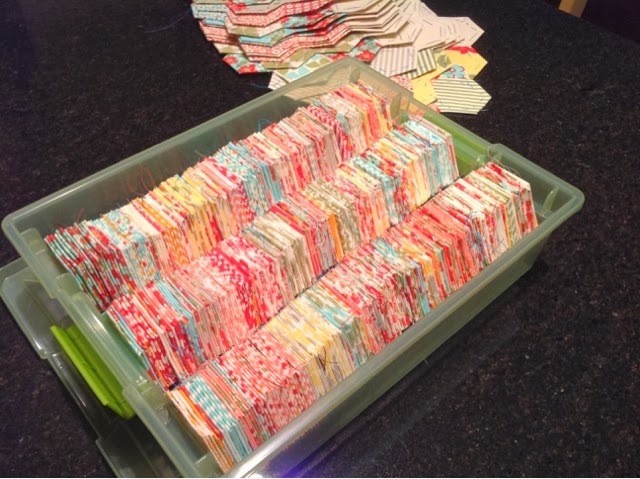 I love my box of hexies :) My granddaughter loves to sort them and design. I am not sure how big I am going to make it, but I was thinking of going for a queen size. I am going to play around with the ones I have completed so far and will post something in my Monday post. Thanks for visiting! Even puppies love epp. The box of hexagons looks great! So many flowers waiting to come out. Thanks Pamela! I guess puppies do love EPP! He always tries to sit in my lap while I am stitching. Thanks so much and I can't wait to watch the flowers come together too! I love the box of hexies!! So beautiful! You made amazing progress this week! Hi Adrienne! Thank you so much for the compliments. I never make this much progress in one week, but I wanted to be able to have something to show come Monday :) I really do think the comments are so encouraging that I want to continue to do more and see it finished. Oh dear, mistakes are the best teachers...we pay more attention next time...and appreciate our accomplishments more. You are looking very good from here! Oh Helen - you are so right! You can bet I have been double checking every one :) Thank you so much for the compliment! 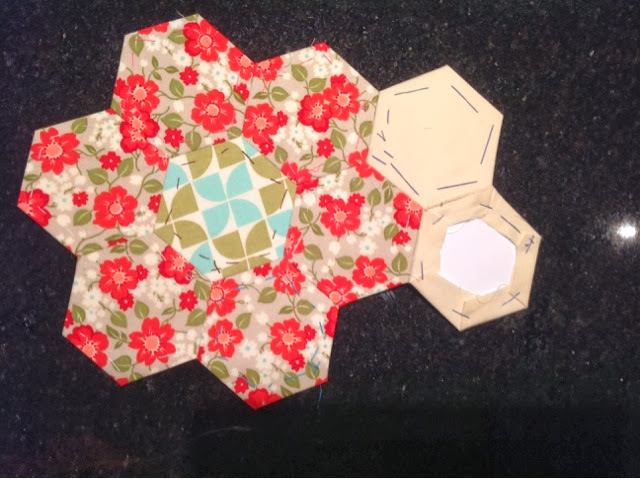 Your hexie box looks so astonishing, I love it, even at this stage the hexies looks lovely. Thank you so much! I do love a full box of hexies :) Maybe next week I will post a pic of my "at home" sewing kit. And then I should figure out a portable kit. I haven't had the opportunity to use a portable kit as most of my stitching is done at home. Oh no to the puppy set-back! Your flowers with the background hexies look so great, and I echo what everyone else has said - your box of hexies looks amazing. That is a box of pure, pretty accomplishment AND future potential!